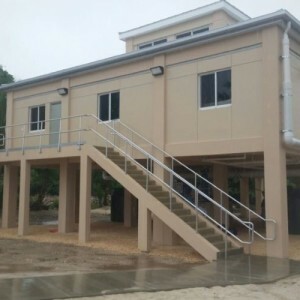 This project was a single two level structure built for the Dominican Republic Marines’ and is used as an Ops Center. The bottom level of the building has two separate living quarters. There is a women’s dormitory with bathrooms and a men’s dormitory with bathrooms. The first level also has a full kitchen, dining room and conference room. The upper level is strictly an observatory which can be accessed via a spiral staircase. The structure was built elevated by the use of stilts that were anchored into the ground. The cement used was prepared in a portable gas operated cement mixer. There is a generator in the back to provide electricity. 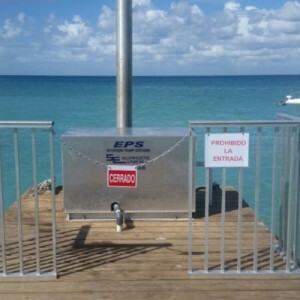 A reverse osmosis system was installed which pumps and filters the sea (salt) water and provides potable water. It is able to produce 1,300 gallons in 24 hours which is held in a 1,500 gallon cistern. Rain water is also collected at the property in another cistern that we installed. We also installed an above ground septic system which drains into a drain field. Some of the challenges were the sight could only be reached by boat. 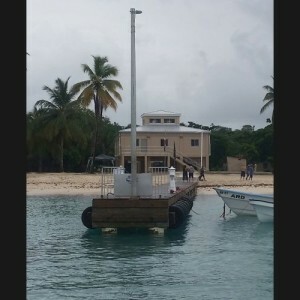 All materials were brought in from the DR or US utilizing a barge or boat. The site was near tourist areas, so we had to take extra safety measures. Lighting was also installed on an existing pier.